How to Get the Most from Your Bundt Pans! If you're looking for a quick and easy dessert, bundt cakes are a great choice. Thanks to the molded pans they're baked in, bundt cakes are beautiful when served plain--no complicated frosting job required! But if you must dress them up, a simple sprinkling of powdered sugar or drizzle of glaze is usually all you need. Although they're simple to make, there are still some tips and tricks that can help you in baking bundt cakes. Following these helpful hints will ensure that you get a perfect bundt cake, every time. Traditional Bundt cake pans hold 12-cups of batter, which is the perfect two-cake cake mix size. Most recipes that make 10 to 12 cups of batter will fit perfectly in most bundt cake pans. As far as other pans go, there is a 6-cup Classic pan, and the Wreath pan holds 6-cups as well. The Festival pan holds 9 cups. The Rose, Sunflower, Star, Fleur De Lis, Bavarian Pan and the Fancy Loaf Pan hold 10 cups each. The Bundtlette Pan and the Mini-Bundt makes six 1-cup small cakes. If you do not see your specific pan in this list, just fill the pan with cups of water and measure how many it takes. The total number of water cups will be the same as your batter capacity. If you've had your bundt cake stick to the pan, you are not alone! Bundt cakes are notorious for sticking to the complicated cake molds, and it can be a challenge to remove the bundt cakes cleanly, without tearing the cakes. I have the best luck by preparing my pans by using a pastry brush to brush on the solid shortening (use butter-flavored for more flavor). I then dust with flour. Make sure all areas are covered, especially the center cone. Instead of flour, you could use a little of your dry cake mix, or for chocolate cakes you can use cocoa powder. If you use sugar instead of flour, your cake will end up with a glistening, slightly caramelized finish. PAM Nonstick Cooking Spray now makes a Baking version, which has flour mixed right into the spray. This is another good choice for preparing Bundt pans. For the best results, only fill your Bundt pan 2/3 full of batter. This will ensure that even with the batter rising while baking, it will not overflow the baking pan. How long should you cook your bundt cake? Baking and cooling times vary according to batter density. I've seen recipes for the 12-cup pans to bake anywhere from 35 minutes to an hour. Bundtlette Pans bake from 15 to 35 minutes. There is no one-size-fits-all answer. Your best bet is to keep a close eye on the cake while baking, and once it starts to appear done, test it with a toothpick. When the toothpick emerges with just a few moist crumbs attached to it, the cake is finished. If your Bundt pan has a smaller capacity, you might have batter left over from a standard cake recipe. If you don't want the batter to go to waste, you can bake the remaining batter in a 3 x 5-inch loaf pan. If you only have one 6-cup pan, put half of the batter in the refrigerator. Allow the batter to come to room temperature and use it when the pan is empty and cool. After the pan is cool, I use a dry paper towel to wipe out excess flour and shortening, then hand-wash the pan. Hand-washing ensures the pan will remain in good condition for years to come. Tangy Kumquat Bundt Cake: This fun twist on citrus cake uses kumquats to give the cake a fresh, vibrant flavor. 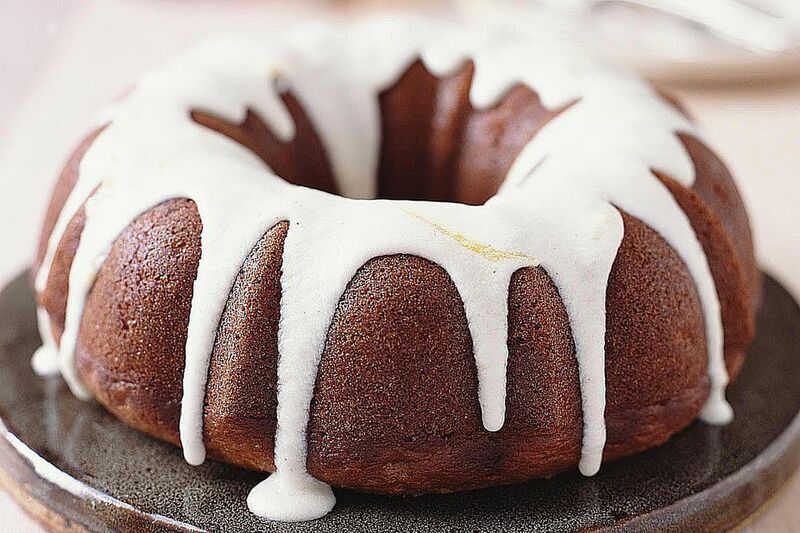 Pumpkin Bundt Cake: This is a lovely bundt cake that tastes great any time of year. It’s also good at tea time too. Bacardi Rum Cake: I make this cake a couple of times a year. It is so good and easy to make too.